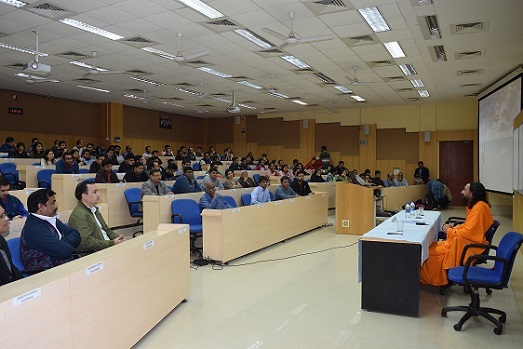 The New Year at IIM Indore kicked off on a optimistic and spiritual note with a guest talk by Swami Mukundananda on January 02, 2019. The talk was organized by the EPGP Corporate Affairs Committee, under the EPGP iKON Guest Lecture Series. 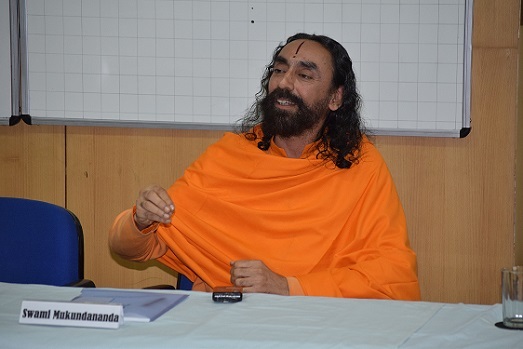 Swami Mukundananda—distinguished teacher of spirituality, yoga and meditation enlightened the gathering full of participants, faculty members and administrative staff and spoke on various topics like science, spirituality and paradigms in management and science. Swami Mukundanand began his talk discussing how spiritual paradigms in management change our perspectives towards happenings in life. Sharing his views about the diversity in this universe, Swami Ji noted that—‘This world is full of immense variety. There are over seven billion people—with different biometrics, different voice, structure, culture, etc. ; even the tree leaves are also different, everything individually is unique. In order to balance the equation between so much diversity, we would require infinite variables, which would be very complex for the human brain to comprehend. Hence we simplify the reality around us and create management models—which depend greatly on underlying paradigms’, he said. Discussing how everyone has his or her own perspective, Swami Ji shared an anecdote—‘A researcher once conducted an experiment and showed to half of his class a set of lines which together appeared like a young lady. Then he shared another set of lines with yet another set of class, which looked like an old lady. On questioning the entire class together, half of the class argued they saw the old lady, and half was sure about the young. However, the set of lines when put together, showed both young and the old lady together, since it was a compoung image’. ‘This is how the world is—it’s like a compound picture—everyone who sees it, can believe something on the basis of what kind of perspective he has’, he said. Swami Ji also noted that the entire world is a form of God, which he created himself. God made everything perfect and everything has patterns embedded which help unfold the divinity of inner being—by giving us challenges in life over and over again. These challenges may come in the form of natural calamities as well—which we humans have to deal with so that we evolve and grow. Swami Ji concluded his talk saying that once we understand the logic behind events happening in our life, we realise that everything happens as a result of our own choice—but the agenda behind all this is growth. ‘With this spiritual paradigm, management and the world take a different perspective. Always keep this perspective with you, that work is a ladder provided by God to help you grow and evolve’, he said. Quoting the famous shloka from Bhagwad Geeta—‘Karmanye Vadhikaraste…’ Swami Ji encouraged the gathering to keep working towards achieving goals, without expecting any results—as hard work will always pay and help in becoming successful. The talk concluded with a Q&A session.